I've been playing Minecraft now for well over eight years. I forgot the details to my old forums account, so that's why this is my first post. I stopped playing Minecraft for quite a long time when Release 1.8 came out up until about two months ago because of the 1.9 combat update. I believe enough's been added in past that now to entice me in again, but one thing remains very, very un-developed to me - the Nether. I remember when the Nether was first announced and got very excited at the prospect of a whole new dimension to explore. When I finally got the chance to explore it, I was...disappointed. There was nothing to entice you into long-term exploration of the new dimension, because everything looked and felt the same. If you've seen one nether chunk, you've seen them all. Even the smattering of additions over the years - like quartz, magma blocks, new mobs, and the nether fortress - have only been band-aid solutions. Think about what makes every Minecraft world feel so unique and new. What's the reason? Minecraft worlds have more than forty biomes, including subsets of bigger biomes that nonetheless have their own features and unique details. The nether...has one biome. Everything else is slapped on top of this one biome with nothing else really going on otherwise. So the solution is biomes. But...what biomes? How do you diversify hell? In Dante's Inferno, the protagonist of the same name explores the nine circles of hell - Limbo, Lust, Gluttony, Greed, Anger, Heresy, Violence, Fraud, and Treachery. I appreciate that some of the younger readers here may not know what some of these words mean - good. You shouldn't, and you won't need to for the purposes of this suggestion. For the older readers - we obviously can't have a biome called "Lust", and "Heresy" is pushing it. We also can't get too biblical - the nether biome was recently rename for that reason - so we'll be adapting the names. Limbo can stay, but for the others, we'll need something more appropriate. 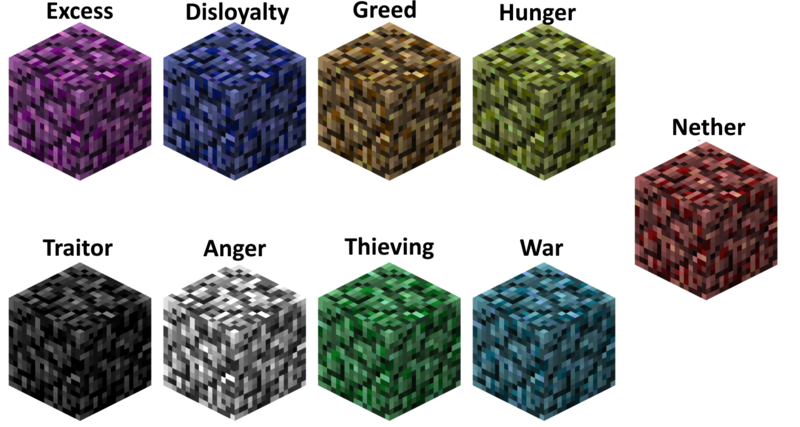 I've come up with Excess, Hunger, Greed, Anger, Disloyalty, War, Thieving, and Traitor - they don't sound a whole lot like biomes, but they're more appropriate, at least. Each of these nine biomes will be added to the standard Nether biome for a total of ten biomes, and each of the nine biomes will be based upon both a. their namesake and b. their description in Dante's Inferno. Firstly, Limbo - Limbo technically won't be a biome in the traditional sense, but more like the end island. Upon making a Nether Portal, the player will spawn in a cobblestone fortress with seven gates. Chests can be found in this fortress with generic goodies in like gold ingots and saddles, but otherwise this fortress is more like the starting point for any player's incursion into the Nether. It being made out of cobblestone means no nether mobs can spawn directly within it, and it is lit well-enough by torches and glowstone to make it a suitable staging ground for the player. Each Nether biome will have netherrack that blends together much like grass does in the overworld. I was thinking of each form of netherrack also being obtainable by itself, but that would lead to complications with blended netherrack. I'm still thinking about how this could play out, but for now - just like standard grass. For those wondering - each biome will generate similarly in terrain to the ordinary nether, just the contents within will differ. I'd like to say I have more creative ideas than this for standard generation, but I don't, right now. Thirdly - Hunger. These biomes will have a new mob - Emaciates. These are zombies that are very thin and emaciated. Quick because of their light weight, but also possessing not much health, Emaciates will spawn in three circumstances - randomly, when players eat food, and around a new type of block called Hunger Sand. Hunger Sand will drain hunger from the player at five times the rate whenever they step on it or start breaking it. However, hunger sand can also be crafted into Sand of Filling. Sand of Filling doubles the food regained by any food eaten when standing on it. 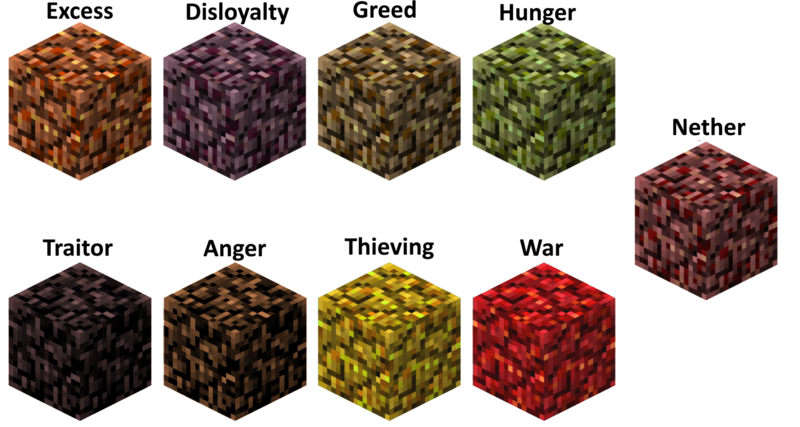 To craft it, one hunger sand and eight different food items of any kind must be placed into a crafting grid. Breaking the Sand of Filling without a silk touch shovel gives you back eight random food items but not the Hunger Sand. Fourthly - Greed. In these biomes, chests will randomly spawn. They will spawn in three varieties - standard chests, often containing nothing more than dirt or similarly menial blocks; trapped chests, which will trap the player via tnt, or spawn mobs, or similar; and mimic chests, that will get up and chase the player down. Killing a mimic chest has a chance to drop genuinely valuable treasure, but only at the same rare rate as other mobs' rare drops. Fifthly - Anger. Any zombie pigmen spawning in these biomes will be immediately hostile to the player instead of neutral like usual. As well as this, so that the player doesn't get caught off-guard by this, their eyes will be red and their skin will be redder, too. Trees of Rage will spawn in this biome. Upon knocking out every wood block, an angry spirit of the tree will grow out of the ground and chase the player. Killing the spirit will drop a sapling for a Tree of Rage. Tree of Rage blocks are a light blue variation of oak wood. Planks of Rage can be used to make Tools of Rage that, although possessing the same durability as wood, have the same mining level as iron and are as effective as iron. Being near any block with Rage in its name will increase the player's speed equivalent to half of Speed 1 and their damage by half a heart regardless of weapon. Sixthly - Disloyalty. In this biome, all mobs will attack each other as well as the player. As well as this, all items and potions have their effects reversed. For example, drinking a potion of poison will instead trigger a regeneration effect, and vice versa. Eating food will actually remove that many hunger points from your bar, but your hunger will not naturally degenerate whilst in this biome. Rarely, throughout this biome, a special ore will generate in veins of one - the ore appears like nether quartz, but a light blue instead. Each one of these ore blocks - tentatively named "Disloyal Ore" - will drop one Gem of Disloyalty. Crafting eight of these together along with a diamond will give you a Crystal of Disloyalty which, when combined with a stick, will give you a Rod of Disloyalty. The Rod can be used eight times to turn eight hostile mobs friendly, although it cannot be used on boss hostile mobs. These friendly mobs will accompany you like wolves. They cannot be healed, however. Seventhly - War. In this biome, all tools wear out twice as quickly, except for swords and bows. All damage is doubled whilst in this biome, whether by the player or by mobs, and, much like Anger biomes, all mobs are hostile on sight. This biome is home to a new type of naturally generating structure - a War Tower. These will spawn fairly frequently - 1 every 200-400 blocks - and be three floors high. Each floor has a mob spawner in it which spawns a random nether mob, and at the top is a special mob - a Baron of War. This mob is a special variant of pigman that uses a crossbow instead of a golden sword. This crossbow deals a fair amount of damage, but the Baron himself only has four more hearts than a pigman, making him a challenge, but not a boss. Killing him has a chance to drop his crossbow, as well as unlocking the three chests at the top of the tower, which contain generic goodies. Eighthly - Thievery. Thieves Dens will spawn in this biome, appearing to be made out of nether brick like fortresses, mixed with a new type of nether block - Bloody Nether Brick and Cracked Nether Brick, which can only be found in these dens. Inside will be thieves, villagers that were exiled from their villages for stealing. Being attack by a thief has a chance for them to take one random item from your inventory, although items on your hotbar will be immune to this effect. If they take your item, they will begin to retreat, although sprinting is still faster than they are. Killing them will get you back your item and will also drop one other random item from a loot pool, with a very small chance for values like iron or even single diamonds at a lower than 1% chance. There are two thief spawners in the Thieves Den. Small chests can also be located throughout with generic goodies. Ninthly, and finally - Traitor. These biomes will be populated by caged mobs that are within nether bars - a special type of iron bar only found in this biome. Nether bars will set the player on fire if broken without protection - that protection being from a special passive mob that naturally spawns in this biome - Repentance Boars. These boars will drop special meat that, when consumed, gives the player the special status effect of Repentance. When under this effect, the boars will follow the player and, so long as one remains in a five block radius of the player, they will be able to break nether bars. The mobs within will usually be hostile, but you can occasionally find trapped spirits that, when released, drop a random goodie for the player. Some of these Nether Bars instead contain chests that have valuables of varying value within. -Nether Trees/Dead Trees: These are a special type of black oak wood that can be used to make dead wood planks. You only get two planks per log, and all crafting recipes for wood objects involving only dead wood planks give half of what any other variety of planks gives. Dead oak doors can be broken by zombies twice as quickly as ordinary doors. Dead wood tools break in the same number of uses as gold tools. These dead trees are throughout the nether in all biomes except Anger biomes, where Trees of Rage replace them. Dead wood sticks can be used with netherrack to make netherrack tools, which has the same durability as wood and mining capability as stone. -Nether Dungeons: Exactly the same as their overworld counterparts, except bloody netherrack is also present here like mossy cobblestone. Mob spawners are in these dungeons and have pigmen, magma cubes, and skeleton spawners. Pigmen spawned from a spawner spawn hostile. Chests contain the same loot pool as ordinary dungeons, plus a chance for diamonds to offset the increased difficulty of finding dungeons in the nether. You can also find nether saddles which allow you to saddle up Repentance Boars. -Abandoned Ruins: These will spawn sporadically in all biomes and will be made out of overworld materials. They will be ruined versions of houses, small castles, and the like, made from cobblestone, oak wood/oak logs, iron bars, and glass panes depending on the structure. These structures will sometimes have crafting tables, furnaces, or even chests in them, and the chests may have goodies as well as partially used tools within them. Nearby, and on their own throughout the nether, you can also sometimes find damaged nether portals, with parts of the frame missing. -Pigmen Abodes: Finally, roughly-made and often lop-sided abodes made from netherrack and nether bricks can be found throughout the nether, often nearby congregations of pigmen. Inside are sometimes chests with small amounts of conventional nether blocks and tools made from dead wood or netherrack. Raiding these chests will anger all nearby pigmen, however. In the light of numerous ocean updates and an update that made the End vastly more interesting and explorable, I find it disappointing that the Nether is still as barren as always. I feel these features would made the Nether more interesting and give players more reason to explore it instead of going in, finding a fortress, and then going elsewhere. No offense but you don't have to put this here. I stopped playing Minecraft for quite a long time when Release 1.8 came out up until about two months ago because of the 1.9 combat update. I believe enough's been added in the past that now to entice me in again, but one thing remains very, very un-developed to me - the Nether. I remember when the Nether was first announced and got very excited at the prospect of a whole new dimension to explore. When I finally got the chance to explore it, I was...disappointed. There was nothing to entice you into a long-term exploration of the new dimension because everything looked and felt the same. If you've seen one nether chunk, you've seen them all. I don't think it's fair to say that those features are only a band-aid. Magma Blocks can be useful to make air bubbles and Quartz is used in a lot of crafting recipe. In Dante's Inferno, the protagonist of the same name explores the nine circles of hell - Limbo, Lust, Gluttony, Greed, Anger, Heresy, Violence, Fraud, and Treachery. I appreciate that some of the younger readers here may not know what some of these words mean - good. You shouldn't, and you won't need to for the purposes of this suggestion. For the older readers - we obviously can't have a biome called "Lust", and "Heresy" is pushing it. We also can't get too[/i] biblical - the nether biome was recently renamed for that reason - so we'll be adapting the names. Limbo can stay, but for the others, we'll need something more appropriate. I've come up with Excess, Hunger, Greed, Anger, Disloyalty, War, Thieving, and Traitor - they don't sound a whole lot like biomes, but they're more appropriate, at least. So no matter where the player creates a nether portal, they will always be teleported to this "Limbo"? No thank you. It would make many nether highways broken and create a potential troll. 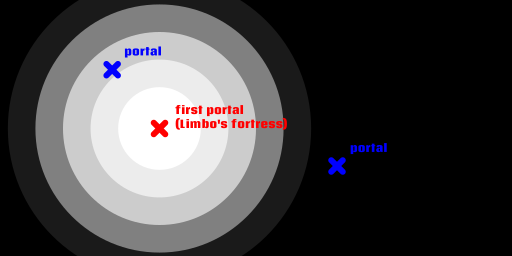 Also creates more question like what if the player create another portal in the Limbo? Each Nether biome will have netherrack that blends together much like grass does in the overworld. I was thinking of each form of netherrack also being obtainable by itself, but that would lead to complications with blended netherrack. I'm still thinking about how this could play out, but for now - just like standard grass. For those wondering - each biome will generate similarly in terrain to the ordinary nether, just the contents within will differ. I'd like to say I have more creative ideas than this for a standard generation, but I don't, right now. That netherack color variation is just too overkill to the point where it could make the nether no longer an iconic torrid wasteland but instead some alieny dimension. Thirdly - Hunger. These biomes will have a new mob - Emaciates. These are zombies that are very thin and emaciated. Quick because of their lightweight, but also possessing not much health, Emaciates will spawn in three circumstances - randomly, when players eat food, and around a new type of block called Hunger Sand. Hunger Sand will drain hunger from the player at five times the rate whenever they step on it or start breaking it. However, hunger sand can also be crafted into Sand of Filling. Sand of Filling doubles the food regained by any food eaten when standing on it. To craft it, one hunger sand and eight different[/i]food items of any kind must be placed into a crafting grid. Breaking the Sand of Filling without a silk touch shovel gives you back eight random food items but not the Hunger Sand. And how would the Player differentiate this chest? If it's just a random chance or "hope for the best" thing then I don't support it. This one is a bit weird. What if I drink a potion that doesn't have a counterpart like invisibility or levitation? Does having a fire resistance burn the player on fire because that'd just be trolly. Also, I think making hostile mobs friendly is a pretty big no. Stealing item ability is just a nuisance since the things that you likely use more for combat and other important stuff is in your hotbar. -Nether Trees/Dead Trees: These are a special type of black oak wood that can be used to make dead wood planks. You only get two planks per log, and all crafting recipes for wood objects involving only [/i]dead wood planks give half of what any other variety of planks gives. Dead oak doors can be broken by zombies twice as quickly as ordinary doors. Dead wood tools break in the same number of uses as gold tools. These dead trees are throughout the nether in all biomes except Anger biomes, where Trees of Rage replace them. Dead wood sticks can be used with netherrack to make netherrack tools, which has the same durability as wood and mining capability as stone. I have to say, the biomes you propose each lacks contents. While yes some of the content is amazing and can make the nether amusing, separating the content just makes each biomes barren. That's why making the Nether having 9 biomes and making them have jarring color variation is a bit overkill. What would be better is if every content in this suggestion would be combined in 3 or 4 biomes instead of 9. Hi Toakralich and congratulations for your work on that idea. From a casual player perspective, I couldn't agree more: I just see no reason to go into the nether, except for farming a few specific blocks or for using a Nether highway. And I almost always switch to the peaceful mode when going in there because fighting in not my primary interest. On the other hand, I suspect more advanced players don't find the Nether that challenging once they got the stuff required to fight mobs efficiently. Anyway, we can all agree: the nether lack variety. I also like your idea of making biomes based on "Wickedness" (I'm not sure this is the correct English word, but I hope you understand). And I personally appreciate the reference to Dante's Inferno. However (you knew it would come;), I'm not sure the mechanics you suggest will match with Minecraft's sandbox spirit. Expecially, I'm not too fond of making the Limbo a kind of warp zone to reach the other Circles of the Nether. In Dante's Inferno, the protagonist is forced to travel through concentric circles of sins. One idea might be to tweak Nether biome generation in such a way the initial landing biome is always the "first nether" biome. Making the nether more challenging/desolated/dangerous while we progress farther from that initial landing point. In other words, generating biomes in a concentric circle pattern centered on the first portal created into the nether. However (again), what about multiple players game? One might consider players will have race to be the first to open a portal in order to land into the "easiest" Nether's Circle. I'm not sure that would add much to the average user's gameplay though. We could also imagine more complex schemes where each new portal will reset the Nether's Circle level to 1 when a new portal is created in a non-previously visited chunk. But that starts adding a lot of complexity to the biome generation engine. So why not simply stick with the patchwork pattern used in the overworld? Concerning the netherrack colors: I think it would be more in the Nether spirit to keep the same "orange" color everywhere. Eventually with some barely noticeable hue or luminance variations. But not much more. But I agree each biome should have a definite signature. You suggested biome-specific mobs. Why not. Given my gameplay, I'll pay more attention to dead trees, dried grasses, gigantic creature's skeletons or dungeon-like structures. But would that be sufficient to give us a reason to stay into the Nether? I feel the need to clarify the "Limbo" biome. It generates once per world - the first nether portal generated, the initial surrounding area will be the Limbo castle. Outside the castle world generation commences as per usual - it's not a middle-dimension or middle-area. It's just a generated structure that generates around the first incursion into the nether done by that world. Thanks for having clarified that Toakralich. Yes, exactly. 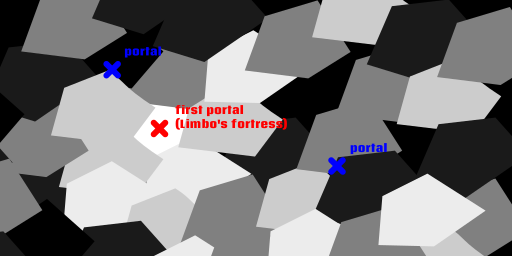 Any extra portals created will generate in whatever biome they spawn in without generating a limbo biome. I also thought of an addendum for Netherrack colours - making them all shades of between yellow to standard red in order to maintain some sort of colour palette consistency. I still feel varying shades like grass and then blended together would be ideal to differentiate how each one looks, but I think pink, blue, and green may have been going overboard. [...] making them all shades of between yellow to standard red in order to maintain some sort of colour palette consistency. I still feel varying shades like grass and then blended together would be ideal to differentiate how each one looks, but I think pink, blue, and green may have been going overboard. Indeed. I wonder if we could make color change subtle enough so identifying which biome (s)he currently standing could be part of the challenge for the player. That would suits especially well if you introduce chest monsters since the unaware player may very well enter in a biome where they can spawn without noticing it immediatly. The new Netherack color choice is nice, how about using JAPPA's netherrack, it'll look less ugly. First, I want to say kudos on the well detailed suggestion and that I definitely agree that the Nether needs more, even if I don't 100% agree with ideas posed here. Feedback below. The main problem I see with this is how it would work in regards to world seeds. On the same seed and version the Nether will always generate the same, which mirrors the End and Overworld. I personally like that reliability, as it guarantees things like Nether Fortresses will be in the same place each time. So how does this work? Does the seed stay the same and this fortress just carves a large chunk out of the world? That would likely cause some ugly world generation. Or does the seed now change based on the starting portal position, removing the reliability that currently exists? Personally, I'm not a fan of giving the player a safe starting area to begin with. The Nether is supposed to be challenging and dangerous, and I think giving the players a literal "safe space" detracts from that. Besides, it takes a couple stacks of cobblestone to make any portal 100% safe so I don't think it is needed. I would rather see Limbo become a unique biome like the others you list, rather than a starting point to house a structure. Why does the wind only go two directions? It isn't a big deal I just thought it was confusing. But in addition to that, you say blocks will stop the wind. Since there are large portions of the Nether that have massive chunks of blocks going from the bottom level to the roof of the Nether, wouldn't the wind almost always be blocked? Or is it that blocks will stop wind if you are within X distance of them? If that is the case, I can see some potential performance loss of the game needing to check your distance from blocks every frame to see if you are safe from wind. I'd make it so you don't get knocked around while standing on Soul Sand or in Lava, as those both slow you down as-is. Then just make so more Soul Sand generates in this biome. As far as the fruit, it seems similar to a Potion of Slow Falling. Would that potion also negate the wind effects? Since it came up later in this thread about alternatives to differing biomes, what about that red tint over everything and the red render distance fog? Maybe those could subtly change based on biome. But you should make the generation for each biome play to the strength of what is in each biome. Take the issues I pointed out with Excess. High winds that are blocked by walls? Sounds like an ideal place to change the generation to large flat plains, similar to Deserts. Maybe multiple layers stacked on top of each other with holes in the floor that the wind might push you into. Thirdly - Hunger. These biomes will have a new mob - Emaciates. These are zombies that are very thin and emaciated. Quick because of their light weight, but also possessing not much health, Emaciates will spawn in three circumstances - randomly, when players eat food, and around a new type of block called Hunger Sand. Hunger Sand will drain hunger from the player at five times the rate whenever they step on it or start breaking it. However, hunger sand can also be crafted into Sand of Filling. Sand of Filling doubles the food regained by any food eaten when standing on it. To craft it, one hunger sand and eight different [/i]food items of any kind must be placed into a crafting grid. Breaking the Sand of Filling without a silk touch shovel gives you back eight random food items but not the Hunger Sand. The enemy and the spawning conditions sound interesting although I will say, as I always do, try to avoid reskins of existing mobs. Do we really need another, slightly skinnier zombie? I'd rather a fully unique model and texture. I'm not a fan of the Hunger/Filling Sand at all in the current form. Hunger is such a non-issue in this game that I'm not threatened by losing Hunger faster and I don't need to gain Hunger more quickly, especially by the time I get to the Nether. What if it acted like quicksand and slowly pulled you under, as if the Nether itself was trying to consume you? Maybe you sink faster the higher your current Hunger? That sounds more interesting to me, gives you a cool new block with a unique function, and the Emaciates could still spawn on it. And since they are eternally hungry, they can run on top of the sand. As for how this biome generates, maybe mostly Netherrack with pools and rivers of the sand? I don't like the idea of trapped chests and TNT being in the Nether naturally, as Redstone doesn't exist in the Nether at all and it just seems unfitting. I am a BIG fan of the Mimic, as that is probably my favorite fantasy creature of all time. I agree with AaronBlader12 that there needs to be a way to differentiate the two. To put in my two cents on the issue, maybe you need to stand near a Mimic for around 5 seconds and then the chest will open slightly revealing teeth lining where the top of the chest meets the bottom of the chest. That way it actually punishes the greedy who just want to rush in and get the treasure. Also, I don't want a way to tame the Mimics (well I do because I love them, but I understand it wouldn't fit well), but there needs to be a way to stun them and collect them so you can use them as traps in your base. Maybe you can offer it Gold to temporarily placate it, allowing you to collect it (unlike regular chests it wouldn't stack), and then you can place it somewhere else. As for the world generation, I'm not sure for this one. Since Mimics and treasure are largely featured in dungeons, maybe this biome generates in a labyrinthine maze of tunnels layered on top of each other? The problem I see with that is the fact you can just dig through walls if you want. I like the idea of automatically hostile Zombie Pigmen, but don't like the Tree of Rage. The first is that once a tree generates it is no longer considered a single tree, but rather each block is counted separately. So maybe there is an X% chance the enemy spawns when you break each wood block instead. Assuming it is similar to an Oak tree, which has 4-5 logs on average, maybe there is a 20-25% chance for each one you break. But I'm not a fan of what the wood is actually used for. I got to the Nether so it logically follows that I have Diamond gear by now. I don't need a new tier of equipment that is worse than my current equipment in every way. I don't fully understand the bonuses for standing near the Rage blocks. First I don't get "why" it would be a thing other than just the word "rage" and I am unsure of how close you need to be to these for the effects to take place. It just seems like it exists to exist. But I can't think of anything better so why not? World generation... since it has trees in the biome, maybe just traditional Nether generation with the trees on it. Plus being chased by Nether Pigmen and having to dodge around trees sounds intense to me. I get the overall theme of the biome, but it is another thing where a lot of the stuff within it seems to exist just to exist. The mobs fighting each other is fine, but unless other mobs just spawn in this area regardless of if there is a Fortress present it is basically going to just be Zombie Pigmen fighting each other, the occasional Magma Cube, and then getting blown up repeatedly by Ghasts. Which on that note, means Ghasts are going to just demolish this entire biome over time if they attack any mobs they see. Not to mention you'd be able to make a super powerful mob grinder easily since all mobs kill each other for you. The reversal of item effects is kind of a tired trope in games, and already exists in Minecraft where Harming Potions heal undead and vice versa. And again, the gain or loss of Hunger isn't really a big deal. As for the item you get, I'd rather see it as a potion ingredient for like a potion of Confusion, that will make mobs fight each other if caught in the radius of a splash potion you throw. And for players, maybe control reversal or something like that. This all seems fine to me, although I don't see why the tools wear out faster. But as with the previous biome, this seems like an easy way to make tons of Mob Grinders easily. Stealing items from players = always a bad idea. It is frustrating and annoying and not fun. The only time I like it is in story-driven games where it happens and you are going to get the stuff back by progressing through the story. Overall I don't have a lot to say about this and nothing really positive, I'm just not a fan of it. None of this really sounds interesting to me, personally. It seems like a lot of tedium for very little reward. Find the special mob, kill the special mob, eat the mob food, find a second special mob, break the bars, kill the mobs, get the loot. Alternatively you can just pop a Fire Resistance potion and break the bars. But I need to know more about what the drops can be to determine if it is worth exploring. And Repentance could use an additional use. All of these are fine. I initially wasn't a fan of the dead wood trees but I think it makes sense to have a way to make tools in the Nether using items only found in the Nether. Just in case you lose your equipment and need a tool and can't easily get back to your portal. Overall the ideas have a solid core and a lot of potential, but needs some tweaking. A lot of the items don't have much use, but they just need more thought on them to expand them a little bit. I agree that the never needs WAAAAY more things yes. However and I mean this in the nicest way possible this just seems to weird for Vanilla. I will say for this the same thing I say for the 1.14 stuff coming (as far as the raids and stuff go)... great idea for a mod but not for vanilla.